This is the first review of a play here on the Ring Modulator, but we do like a few excursions from time to time. Having never reviewed a play before, I hadn't really thought about how it's different to reviewing music. For starters, it doesn't seem on to be scribbling on a notepad during the performance. There's also the issue of plot spoilers, so I'll try not to give too much away. 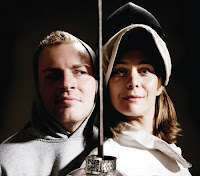 Suffice to say 'Fencing for Losers' was a really engaging play with a great story. On the surface it's a variation on posh girl meets rough bloke. In this case a successful PR woman from Cheshire, Susan, is running a fencing evening class to which unemployed Salford rough diamond, Danny shows up. Rob Johnson's excellent script calls for precise and crisp articulation of the dialogue to deliver its rhythmic punch, and actors Szilvi Naray-Davey and Phil Briggs don't let it down. Naray-Davey conveyed the complexity of Susan's haughtiness expertly, revealing the layers of repressed vulnerability with a well paced slow burn. Briggs got Danny's threatening swagger bang on, the cutting wit of his one-liners pitched with a biting Salford accent. The bantering between the characters cleverly drew out their hypocrisies and prejudices, eventually pushing Susan to reveal a raw truth. This leads to a proposition from Danny, the moral ambivalence of which makes us wonder where this is all going. The simple staging met the shifts of mood from lightness to darkness very effectively, and there were some great soundtrack choices too, especially the Andrews and Jules version of 'Mad World', always perfect for those melancholic moments. The play's on again tonight, so get yourself down for that last show of this run at The Lowry. More info on further shows from this great local theatre company on the Ignition Stage website.